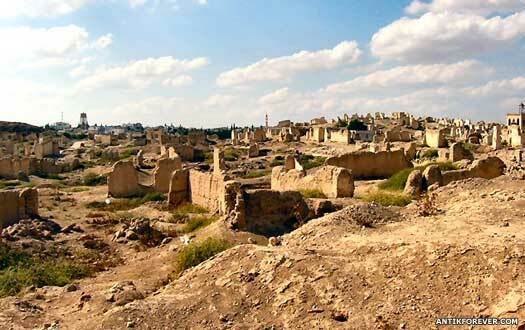 Located in the western centre of ancient Syria, to the south of Alep, Qatna (modern Tell-el-Mishrife), was in the Wadi il-Aswad, a tributary of the Orontes, 18km north-east of Homs. With remains covering a kilometre squared, Qatna must have been one of the largest Bronze Age cities in western Syria. It was occupied from the very beginning of the second millennium BC, probably by Amorites. For a long period in the early second millennium the city's most stubborn enemy was the state of Yamkhad, which was centred on Alep. In some records the city is known as Nukhashshe. Amorite. First king known by name. Having been an ally of Shamshi-Adad's kingdom of Upper Mesopotamia, when that kingdom falls, Qatna is restored to full independence. Son. Former governor of Nazala. The daughter of Amut-pi-el, Beltum, marries Yasmah-Adad of Mari. Another daughter, Dam-hurasim, later marries Zimri-Lim of Mari. The king offers his territory to Elam in order to gain support in his conflict against Yamkhad. After the destruction of Mari, records concerning Qatna become sparse. The state of Yamkhad which is based at Alep becomes Qatna's main opponent. Yamkhad has become so powerful that it temporarily dominates Qatna under its ruler, Yarim-Lim III. In the political collapse which follows the Hittite destruction of Alep and the sacking of Babylon, the city declines. By the end of the century it is part of the Mitanni state which unifies much of the region, lying on the border which forms disputed territory between Mitanni and Egypt. Inscriptions on the Nin-Egal temple which is part of the royal palace shows that Mitanni maintains a presence in the city, but there is also an Egyptian influence there. Cuneiform tablets found by archaeologists in AD 2002 under the royal palace reveal a previously unknown ruler of Qatna at this time. The city is still part of Mitanni, and a Mitanni which is still very strong but which is no longer quite so aggressively all-conquering as it once had been, so perhaps client kings are allowed to govern this border city which is now constantly threatened by the Hittites and an unstable political situation in Syria. Egypt still has enough power in the region to install its own client king in Idanda's place. Mitanni is now split by a dynastic struggle and is in no position to defend its outlying borders. The Hittite king, Suppiluliuma I, campaigns in Syria, and Qatna is one of a number of cities which are captured and plundered. Akizzi asks Egypt for help but none is forthcoming while that country is in the midst of its monotheistic reforms. Qatna's populace is transported to Hatti, but the city apparently remains occupied. Emar records that Qatna is attacked by Aramaeans. Following the Bronze Age collapse of the early twelfth century, Qatna loses its significance as the trade routes switch to nearby Homs. While still occupied into the sixth century BC, Qatna never regains any level of importance.